Washington DC, July 23, 2003--The newly created Iranian American Political Action Committee (IAPAC) held a kickoff reception July 22 at the Phoenix Park Hotel in Washington, DC. The reception was a huge success, attracting well over one hundred attendees. The crowd was so large that the room in which the reception was held was filled to overflowing. The reception was attended by three United States Senators-The Honorable Edward M. Kennedy of Massachusetts, The Honorable Charles E. Schumer of New York, and The Honorable Thomas R. Carper of Delaware, as well as by distinguished Iranian Americans from many sectors of American society. The program began with introductory remarks by Hassan Nemazee, the founder of IAPAC. Mr. Nemazee, who is also the Chairman and CEO of Nemazee Capital Corporation, emphasized the accomplishments of Iranian Americans in most areas of American life. He noted, however, that in politics, Iranian Americans have yet to assume a prominent role. 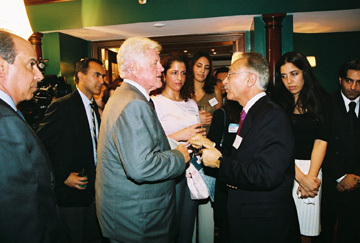 Mr. Nemazee stated that IAPAC's foremost purpose is to ensure that Americans of Iranian descent have an influential voice and presence in the American electoral process by promoting and supporting the election of candidates for federal, state and local office, regardless of their party affiliation who are attuned to the domestic needs of the Iranian American community. Mr. Nemazee also emphasized that "IAPAC is a political action committee focused on the needs of our community in the United States and is not focused on U.S. policy towards Iran, establishing ties with or legitimizing the government of Iran." Also representing IAPAC was Morad Ghorban, who serves as the political director of IAPAC. Mr. Ghorban, who immigrated to the United States from Shiraz as a child, emphasized his American patriotism, while noting that"...there will always be a little piece of Shiraz in my heart." In discussing IAPAC, Mr. Ghorban noted the importance of PACs in the American electoral system. He also emphasized that IAPAC will work to promote the interests of Iranian Americans in a non-partisan manner by making financial contributions to both Republican and Democratic candidates running for political office. Among the chief issues of concern to IAPAC, Mr. Ghorban said, are immigration reform and civil liberties. The discussions of IAPAC provided by Mr. Nemazee and Mr. Ghorban were interspersed by speeches from each of the three Senators in attendance. Each senator spoke of his pleasure at the growing political assertiveness of Iranian Americans which IAPAC symbolizes. The Senators also provided personal anecdotes which illustrated their connections to Iranian Americans and to other Americans who have roots in the Middle East. Senator Kennedy spoke of his strong efforts to combat hate crimes against Iranian and other Americans. The Senator also emphasized his personal ties to the Middle East, noting the Lebanese heritage of his wife, Victoria Reggie Kennedy, and the ascent of his wife's family to prosperity. Senator Carper spoke warmly of his associations with Iranian Americans and his commitment to work with the Iranian American community. Senator Schumer noted that with the formal inauguration of IAPAC, Iranian Americans are following a pattern of entry into American political life that is common for most immigrant groups. Senator Schumer also spoke of his commitment to work with and engage Iranian Americans in the political process and the need to combat racism in American society.